Just got this email from Funimation. Apparently Funimation has teamed up with Vside to host a virtual anime festival. Showing at this festival will be xxxHolic and School Rumble. I really enjoyed xxxHolic, so if you havn’t seen the series, getting your spot in this festival will be worth it. 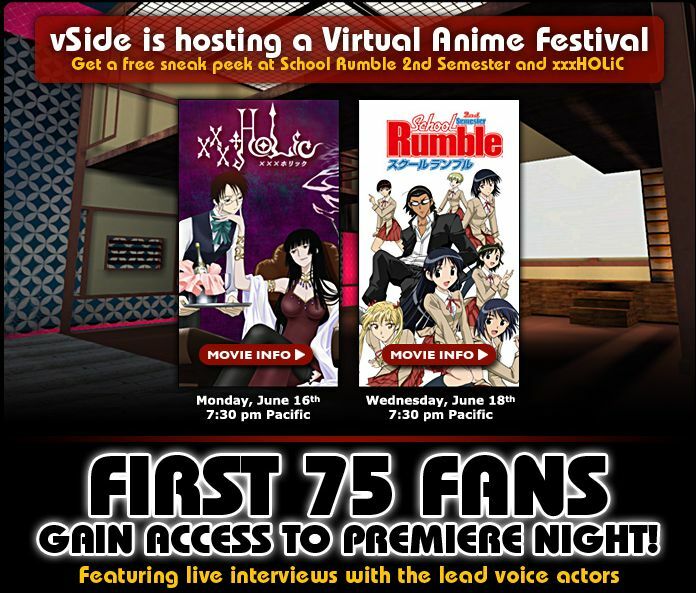 The first 75 who register gain access to the premier night that includes live interviews with the lead voice actors. All other guests who register by June 11th will be able to watch the shows after the premiere. I’m not a fan of downloading player applications, but I’m sure you will be safe if Funimation has decided to team up with them. Head over to the promo page for more details.